Jason Marshall's 2003 arrival in New York City signified the continuation of hard swinging, forward thinking baritone saxophone playing. With early encouragement to appreciate all types of music, Jason has developed a style that encompasses with whole of African-American music. A special interest is given to the amalgamation of soul, R and B, and funk with straight-ahead jazz. Years of dedication and perseverance have resulted in a giant, soulful sound and instantly appealing concept. Influences such as Leo Parker, Nick Brignola and Bruce Johnstone have coalesced to ensure an open perception of the baritone sax and a “take -no-prisoners” approach to playing jazz music. Jason has studied with no less than the elite baritone saxophone specialists of the 20th century including Hamiett Bluiett, Ronnie Cuber and Gary Smulyan. These Three masters of the instrument have contributed invaluably to Jason Marshall’s ability, each one pouring their own personal wealth of knowledge into him. Other teachers include altoists Bruce Williams, Mark Gross, Steve Wilson, Vincent Herring and tenor players Greg Tardy, Wayne Escoffrey and Paul Carr. Mr. Lorenz Wheatley garners special distinction as being Jason’s first saxophone teacher and earliest source of musical direction. Jason’s formative musical experiences include stints with the Thad Wilson Jazz Orchestra and Bluesman Roy Gaines. 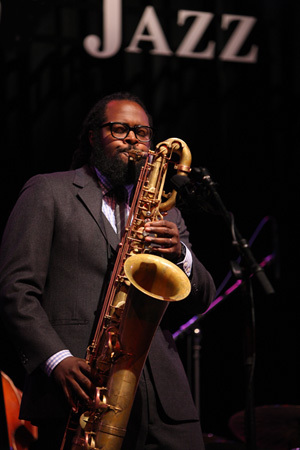 He is currently playing and touring with Roy Hargrove’s band RH Factor and the Roy Hargrove Big Band. Jason’s band “Overt Negritude” has Released its debut, self-titled album. Jason has also conducted numerous demonstrations, clinics and workshops at every level of education throughout the world.